It’s officially time for the graduation season to begin! 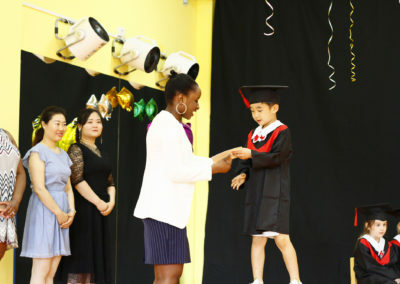 The students from Kindergarten and German class took part in their first graduation ceremony. Led by their teachers, the students marched proudly into the Gym and were greeted by camera flashes and sounds of congratulations as the senior students cheered and delighted parents took lots of photographs of their beaming graduates. The students from the German class performed a traditional German song, <Alte Schule altes Haus> as their Lead Teacher, Sabine, played the guitar accompaniment. The students from Kindergarten sang a Chinese farewell song called <Seeing off>. The beautiful songs suited the occasion perfectly as the children said goodbye and offered their thanks to their old school and they now look forward to the next stage of their school journey. The students from German Class and Kindergarten received their graduation certificates from their Lead Teachers respectively, Sabine and Belinda. The children were so happy and excited to receive such a special acknowledgement of their time in Kindergarten. All the parents were really proud of the children and took many photos to remember the unforgettable moment. Tears of pride and joy could be seen in the parents’ and teachers’ eyes. The most unique part on the day was the “throwing kids” ceremony, which is a traditional German graduation celebration. The teachers carried each student on a colorful cloth and then ran to the child’s parents, tip out the child into the arms of their parents who would surround them in a hug. It was a new and really fascinating experience for many of our families who thoroughly enjoyed the fun ceremony. Although the general mood of the day was one of celebration and happiness, some of the parents and teachers also felt the pangs of sadness as this chapter of the young graduates’ school life draws to an end. We would like to offer our best wishes and Good Luck to all graduated students: we trust you will grow up healthy and strong and have a bright future ahead! Enjoy your Summer Holiday!